HAN Automotive Research (HAN-AR) is part of the Automotive Institute (currently celebrating it’s 75th anniversary) at HAN University of Applied Science. HAN University offers several Bachelor's and Master's courses, one of which is Automotive Engineering. The course of the training provides extensive knowledge in the fields of design, production, testing, management and maintenance of road vehicles. Modern automotive technology is facing major challenges particularly in the areas related to sustainability, connectivity and the environment. These fields are experiencing rapid development, in order to be able to offer our students the latest state-of-the-art technology and to keep the connection with the business world at its best, HAN Automotive Research works closely with companies in the automotive industry. 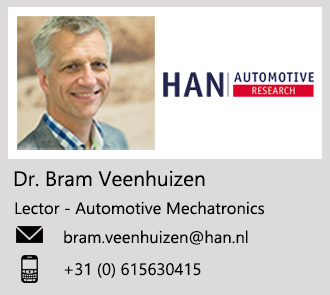 HAN Automotive Research (HAN-AR) was founded with the objective to strengthen the connection between education field and the professional field. This "connection" is best achieved when students are directly involved in current innovative issues from the industry. HAN-AR makes this connection by focusing on implementation of Research and Development for the issues faced in the business world. The results and the accumulated knowledge not only benefit the professional sector but are also used directly to strengthen education. Students benefit from this because they gain knowledge and the working methods of their future employers. The industry benefits from the quality research executed by our students. 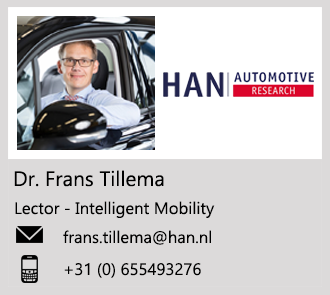 As a Research and Development institute, HAN-AR is a very interesting partner for governments, the automotive industry and for small and medium-sized companies looking for solutions in the sectors of design, research and testing. Thanks to the connections with the automotive industry, knowledge institutes, the expertise of teachers and researchers and the strength of student teams, HAN-AR can offer affordable expertise and manpower leading to innovative solutions. Clients gain access to extensive computer facilities and costly high-end software programs through the collaboration with HAN-AR. Clients can also gain access to the extensive research laboratory with a wide range of test and measurement equipment. It is the mission of HAN-AR to become the "preferred research partner" for the automotive sector in the region. The research team of HAN-AR, with approximately 20 employees, focuses on a number of specific disciplines, namely structural design, modeling, monitoring, control systems, prototyping and testing. 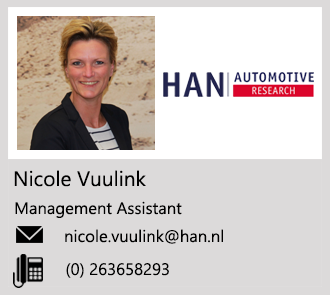 HAN-AR focuses not only on automotive applications but also on adjacent sectors such as engines, energy, internal transport, logistics or the agricultural industry in which the automotive knowledge is transferable or overlapping.